Live by oil, now die by oil. The process has been exactly the same each month. 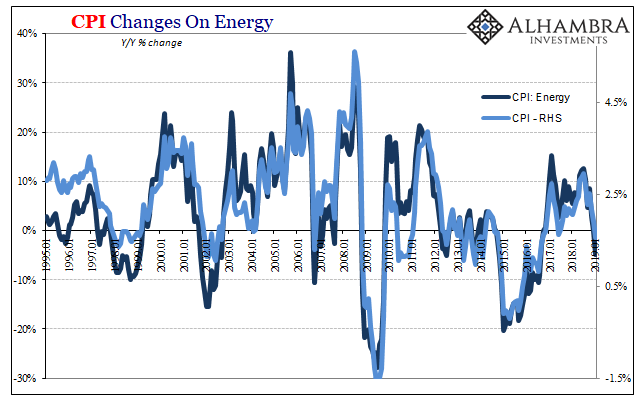 The energy component once amplifying the headline has turned around to subtract from it for the second straight, down nearly 5% in January. That follows from a 10% decline year-over-year in motor fuel prices, mainly gasoline. Itself a product of WTI. Even though the average price of US benchmark crude oil was a couple dollars higher in January than December, the annual decline was much greater last month. 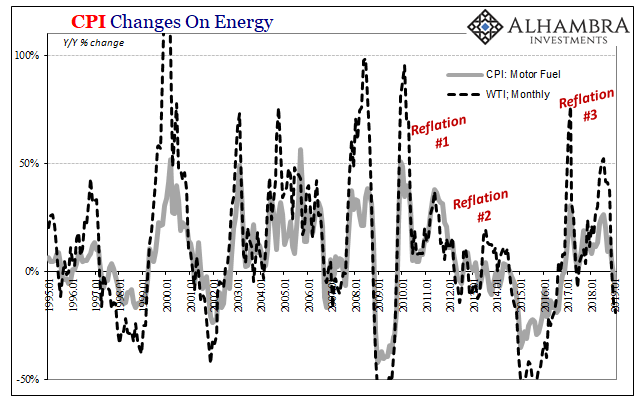 Falling by right around 20%, that level of oil retrenchment is how we end up with just 1.55% headline inflation. What’s missing is everything else that was supposed to have taken its place long before 2019. 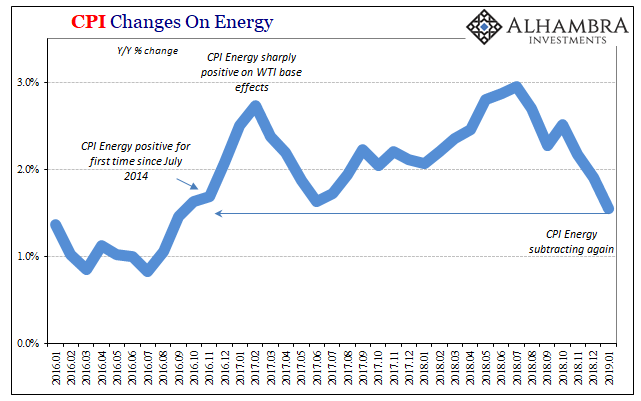 You know it by heart by now: unemployment rate says tight labor market, maybe extremely tight; employers have trouble finding workers they badly need such that they have to pay a lot more to secure them; those increasing wage costs are passed along to consumers in the form of accelerating prices outside of the energy sector. There is just no evidence that is taking place, or that it was ever even likely. 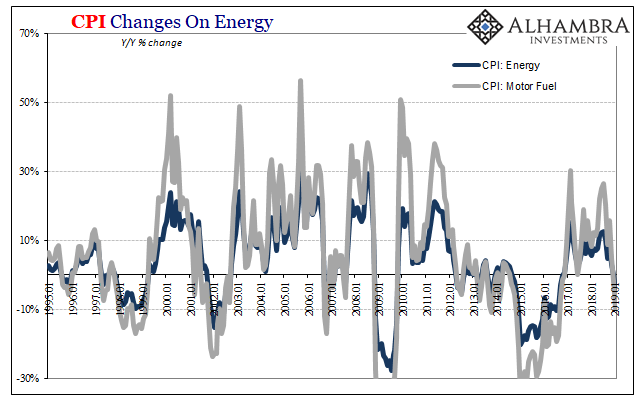 Instead, inflation has been consistently mute in the components separate from gasoline effects. 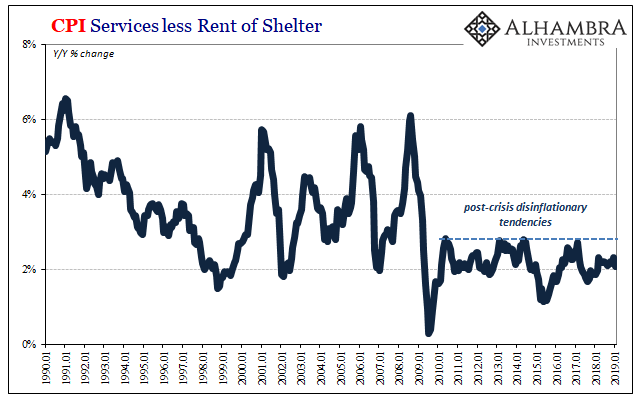 Note particularly the disinflationary stubbornness of the services sector. All that is old news by now. The media will keep talking about inflation expectations and the booming economy, labor market, too, but markets have moved past all that. 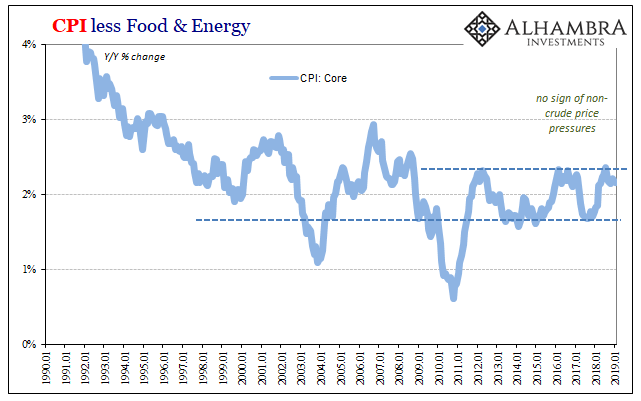 Falling inflation rates already show the flaws in the boom argument and bolster the inverted curves. What’s left to decide is exactly what this means.